Manual sanding is a drag in more ways than one. Not only is it tedious, but the drag, or friction, of the sandpaper against the work material can quickly tire you out. When uneven pressure is applied to the work material with manual sanding, the surface may end up with stroke marks, gouges, and lines. Electric sanders are the way to go in a vast majority of home projects. But there is no universal electric sander that works for all needs. For the best results, choose a sander suited for that type of work. The random orbital sander is by far the most common type of electric sander found on store shelves today and easily is the most versatile. The orbital part of the name comes from the circular action of the sanding disk. The random part comes from the eccentric motions that the head makes in addition to the orbit. If you had to choose only one type of sander to buy for home projects, it would most likely be a random orbital sander, as it is versatile, inexpensive, and easy to use. Random orbital sanders prevent scuffing and scarring of the wood if you happen to go against the grain. This type of sander is easier to wield than a rotary or belt sander because its action is more like vibration. Changing sandpaper is extremely easy, simply a matter of affixing the paper to the sander's hook-and-loop surface. If the random orbital sander is your only sander, you may find yourself trying to over-extend its usability. It does not work well for projects where you need to significantly bring down the wood. Random orbital sanders are best used for fine projects, chairs, tables, or trim and baseboards where the surface condition is highly important. A belt sander has a continuous loop of sandpaper (called a sanding belt) running through the machine, similar to the way the cutting chain runs through a chainsaw. Belt sanders are good for ripping off the rougher initial stages of any sanding project. Unlike random orbital sanders, which cause the sandpaper to vibrate, a belt sander actually moves the sanding belt. This is a notable difference that you will appreciate when you need to sand down rougher areas. Changing the sanding belt and keeping it rotating straight can be difficult with belt sanders. As a result, you may end up with torn belts that needs to be replaced often. Due to space limitations, belt sanders are not good for getting close to walls and other edges. Belts sanders are best used for removing exterior paint, hitting high spots on wood flooring, and removing extraneous wood material. A rotary sander is any sander, handheld or floor mounted, whose head turns in circles. Rotary sanders allow you to get close to edges and are safe to use on nearly all materials. You can use a rotary sander for sanding wood flooring right near the baseboards, where other sanders will not reach. Or you can use a rotary sander for smoothing down trim to a mirror-like finish. Rotary sanders can get out of control, so they are best for experienced do-it-yourselfers. A drum sander is a specialized belt-style floor sander. Drum sanders rest on the floor and are pushed via a handle, much like a lawn mower. Too expensive for most homeowners to purchase, drum sanders are commonly available from rental centers. Drum sanders should be used for solid wood flooring only. Do not attempt to use a drum sander on engineered wood flooring or non-wood flooring. 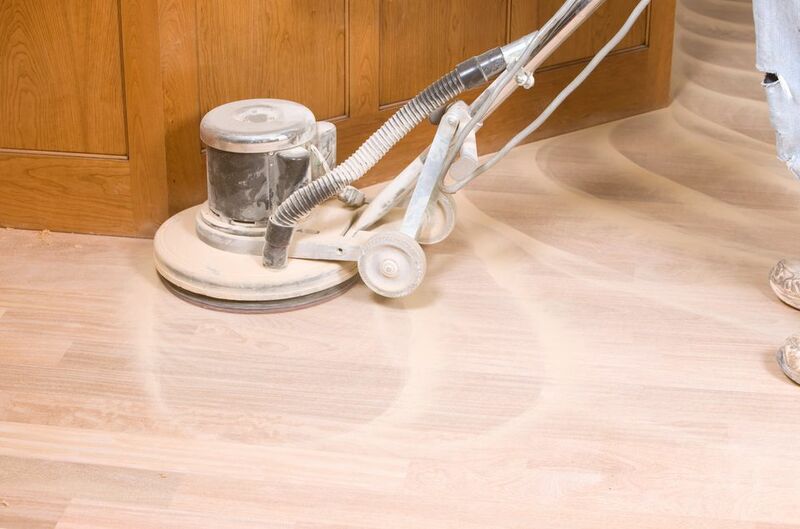 Drum sanders are so powerful that they are capable of sanding off all sorts of materials that you want removed from your wood floor: bumps, gouges, stains, paint, adhesives, and mastic. Note: before sanding any flooring adhesives, test to make sure that they do not contain asbestos. Drum sanders are very heavy and require two people to transport. If you aren't careful, you can easily gouge into your wood flooring because these machines are so powerful. Like manual belt sanders, drum sanders are difficult to adjust in order to keep the belts running straight. Spindle and disk sanders are table-mounted machines that allow for greater stability than with handheld machines. With spindle sanders, the sandpaper is mounted on a tube-like base. With disk sanders, the sandpaper is mounted on a disk, essentially a table-mounted version of the handheld orbital sander. Spindle and disk sanders are best for sanding down small items for woodworking projects. It can be difficult to control the work material on these sanders, but it can be accomplished with care and practice.